Travelling has always been my favourite thing to do and I’d often love to explore any and all new locations at the weekend if I was free and had some cash in my pocket. As a first-time mum, I wanted to keep travelling and wanted to show my child how beautiful the rest of the world is. I just needed to make a few tweaks to get things right for a family vacation instead. I’ve heard the other mums say that travelling with their kids had been a challenge and some of them said that they were putting travelling off for a while until their little ones were older. I told myself that I’d take on that challenge and show them that it isn’t as bad as they were saying. I often travel for business with Aviation Spares and Repairs, a ground support equipment supplier based in Romsey, Hampshire, and from time to time I have to take my baby with me when the childminder couldn’t stay with him. The first time I went travelling with him it was for leisure. I did feel that the days of ‘winging it’ were over, as I was sure that getting ready for my first travel with the little one would take some thorough planning – but it was all good. Maybe you are looking forward to that well-earned, long summer holiday that you’ve been planning for months, but started stressing out about the fact that it will be your first time travelling as a family and you are unsure how the kids will act. Will they spend the whole time screaming? Will they keep saying ‘are we there yet’? Continue reading below for my tips on how to travel with kids and have a great and stress-free(ish) experience on your first family vacation. It is important to choose a family-friendly destination that will be ideal for all members of the family. After all, this is your holiday too! Research about destinations which will have something for everyone. Do you want a relaxed holiday at the beach? Do you want to explore nature with your children? Or maybe you want to have a city trip? Your children might be too small to walk for long periods of time, so maybe forget about that hiking trip to Bali that you have been dreaming about for now, and in a few years, you’ll be able to go all together and fully enjoy it. If your children love history and museums, Rome could be a good idea, visit the Sistine Chapel and offer them gelato afterwards if they’ve behaved well (and enjoy one yourself as well). A holiday which is always a hit with my little one is a beach holiday – it gives him plenty of space to play and for me to relax. I always make sure to research attractions nearby to visit and other places to explore, as the little one can easily get bored. You can always pick an all-inclusive holiday or go on a cruise, both options will give you enough to do and will ensure that you’ll all have a good time. While travelling with young children there are always small things to consider when picking a place to stay. There are two main options – you can either stay at a hotel or an apartment rental. If you are staying at a hotel, make sure that there is lift access to rooms, nobody wants to be carrying luggage and strollers up five flights of stairs. Also, ensure that the hotel has child-friendly activities and food menus. If you have a small baby, contact the hotel to certify that the hotel provides a cot and extra bedding. Hotels have perks, whether it is room service or babysitting services, however, as an article on Momondo states, “vacation rentals mean you can make it your home – and prepare your own meals, which might be useful if your child has a special diet.” Apartment rentals will give you more freedom and space if you are staying for a longer period of time. An article on the New York Times also agrees that “renting a house or apartment is usually the way to go when travelling with kids.” Places such as Airbnb offer various options, from room rental to a whole house rental. The latter is ideal when you are travelling as a family, even more, if you are on a budget – reduce the costs of eating out by preparing your own meals. For the first trip as a family considering a direct flight could save you a headache. It might not save you money but spending a bit more on a flight in order to not spend hours in a queue at an unfamiliar airport with a cranky toddler can be a really good idea. A direct flight to your destination will ensure that both you and your child have enough time to rest. Paying a visit to the GP a few weeks before the big holiday for a quick check-up could do wonders. Making sure everyone’s vaccinations are in order and if any of you have a medical condition, you can always ask the doctor for advice on how to deal with it while on holiday. The NHS advises to start preparing for a trip from 4 to 6 weeks before travelling. It is also advisable to look at travel insurance and if you are travelling within Europe, make sure you have a valid European Health Insurance Card (EHIC). It’s highly important to choose activities for the whole family to enjoy. You can even alternate between child-oriented activities and adult activities. It is also important to let the child choose some activities themselves to truly know what they want to experience. A good tip is to plan ahead and maybe pre-book some activities. This can help you save some money and will give you a chance to speak to your little one about what different things they want to do while on holiday. Also, remember to take advantage of free activities, anything from cultural events to street fairs or even a bike ride to the top of a mountain to watch an amazing sunset can be all very enjoyable. For some, the idea of flying is exciting and exhilarating. But there is more to travelling than flying, you should have a conversation with your children and explain the whole process of reaching your destination both at the airport and on the aircraft. An article on Skyscanner mentions that if your child is afraid of flying, playing aircrew or pilot role-playing games with them could make them more comfortable and help avoid pre-flight and in-flight panic. Pack as little as you can. I know this might seem quite difficult, but depending on where you are travelling to, there are many things you can get at your destination (e.g. toiletries) and there is always the possibility to find laundry services or washing machines to wash your clothes. Choose comfortable and versatile clothes for everyone and maybe one set of nice clothes to have dinner out one night or two. It is also important to bring a few home comforts, whether it is their favourite cuddly toy or the only book which makes them sleep for hours on end. Depending on airplane food is not a good idea and I’m sure you are aware of this. Airplane food is overpriced and not as great as your own packed food. Hungry kids and even some hungry adults can make a fun trip into a miserable one in a matter of seconds, so make sure to pack some snacks for everyone. Ensure all passports are valid weeks before flying, and if you have a recent-born baby they will also need their own passport. If any of your children have different surnames from yours, you might need to bring extra documentation to establish your relationship with the child. According to the Home Office, it will help if you bring evidence of your relationship with the child, for example, birth certificate or adoption certificate. Regarding your airplane tickets, it will be easier to print them out. Leave all your travel documents in a secure place where you can quickly grab them before you leave for your travels. While I’m at the airport, I often create airport I spy games to play with my child. We’ll try to look for various ground support equipment (e.g. baggage carts, aircraft belt loaders), different types of planes and airline cabin crew operators. To be honest, he’s also happy just looking out the large airport windows seeing the planes taking off and landing. But I’ll always have different games for us to play or toys for him to play and books to read. If all fails, I’ll have a few cartoons downloaded on my phone for him to watch. Make the most of the travel packs the flight companies give too. It’s okay to take your trip slowly. 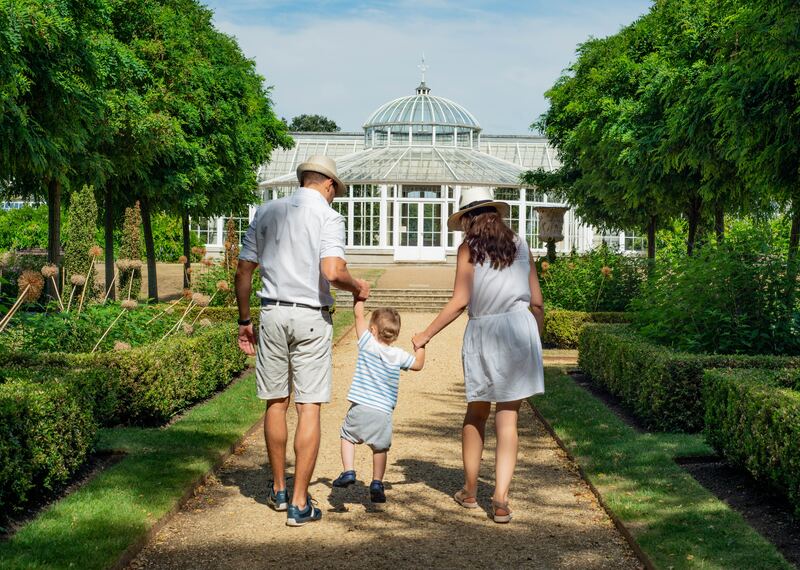 As adults, we are happy to walk around and see an array of different attractions and enjoy a plethora of activities, and when we are by ourselves it’s easy to power through a long day of things to do, but children are more likely to get tired and bored quicker. Make time for some downtime, whether it means taking a nap, reading a book or simply laying in the grass at a local park. The best way to prepare your children to a big family vacation is by doing a practice run before. Go away for a weekend to a nearby town or go visit close family that live a few hours away. A trial family trip will help you figure out how fast you’ll be able to explore a new place and how the child will feel about that new experience. The most important part of any family holiday. I hope that these tips have been helpful and that you’ll have a great family vacation. What are your own tips on how to make your family trips stress-free? ← Why Booking a Cruise is the Easiest Way to See the World?